Just in time for heavy rains, we have a brand new van and plenty of equipment to Make it "Like it never even happened." Call SERVPRO of Clay County if you experience flooding or water damage. SERVPRO of Leawood/Overland Park is extremely dedicated to the community and those who live within it. 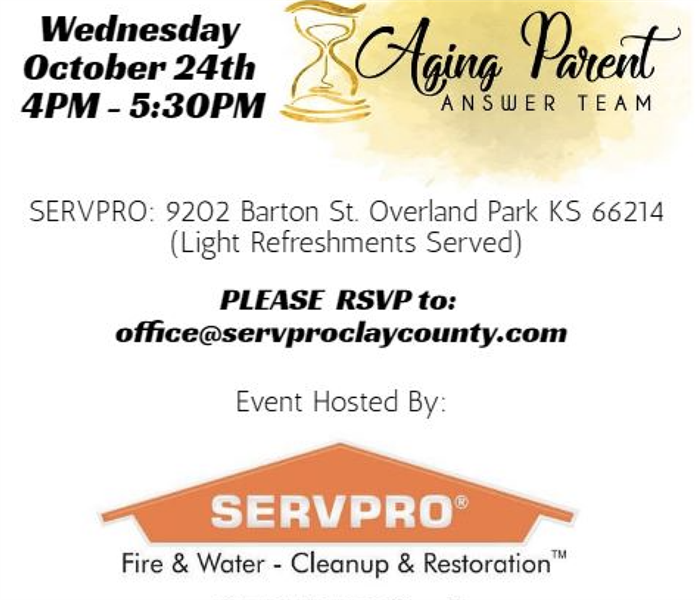 We are excited to be a part of this event on Wednesday, October 24th, from 4pm - 5:30pm. This Leawood commercial customer wasn't sure how to clean up after the devastating water damage to their property. They called us at SERVPRO of Leawood/Overland Park to tackle to job! We knew just how to place the necessary equipment to dry the property. This is the aftermath of a small bathroom fire. The drywall and tile was damaged from the wall caving. SERVPRO responded and began rebuilding the bathroom back to normal conditions. After a fire in this Leawood Kansas home, this closet suffered from fire damage. The content in the closet was ruined. The closet was cleaned out and rebuilt back usable conditions. This bathroom suffered from a small fire. The insulation was damaged from the fire and water. The fire restoration team responded and demoed and rebuilt the bathroom back to pre fire conditions. This was the aftermath of a fire in Leawood KS. SERVPRO responded and began fire cleaning procedures. The drywall and insulation was removed and replaced to restore the bathroom back to normal conditions. 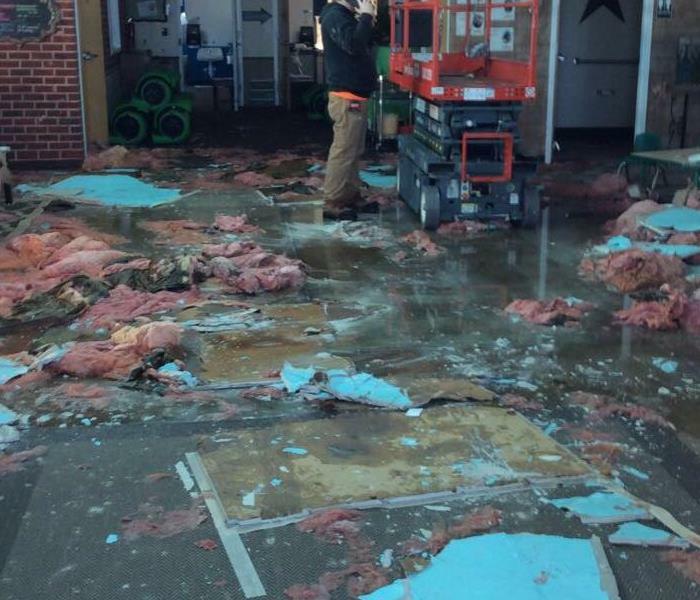 The classrooms and belongings suffered from wind and water damage. The team responded and packed up the belongings to store during rebuild. Some of the content had to be cleaned professionally to restore back to pre storm conditions. This was the aftermath of a storm that hit the Overland Park area. The structure had suffered from storm damage. The drywall was torn out down to the studs for drying and rebuild. After a severe storm hit the area, the roof of the building had damage from the storm. The debris and drywall was falling into the lobby of the building. The team responded quickly to begin clean up procedures. 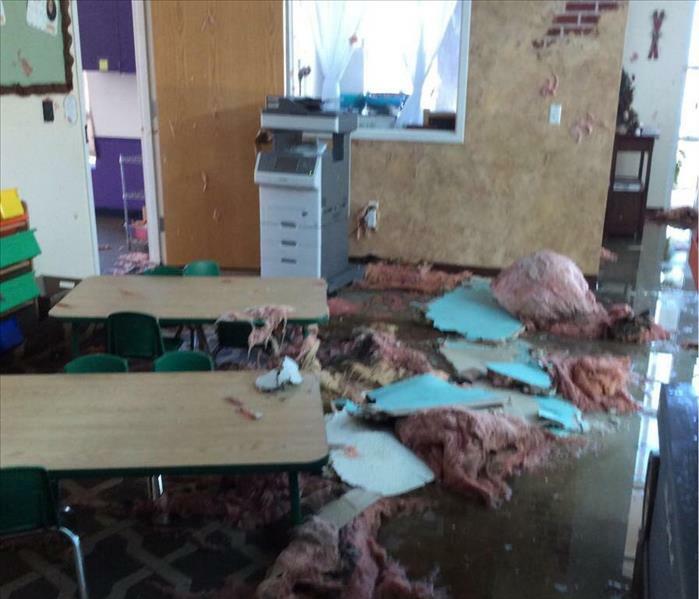 The daycare suffered from roof damage after a severe storm hit the Overland Park area. The insulation and drywall had fallen out of the roof causing a huge mess. SERVPRO responded with the storm restoration team for a quick recovery. 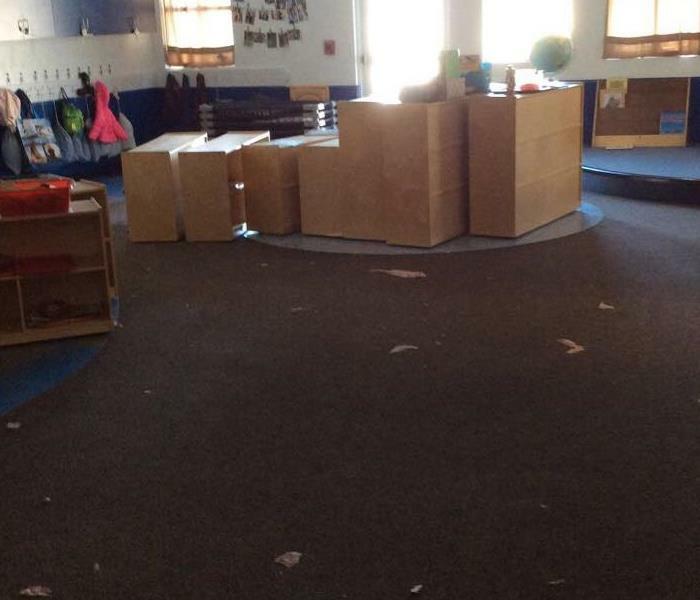 This daycare center suffered from a water damage. SERVPRO responded and began mitigation. The belongings were packed up and stored while rebuild was going on. Air movers and dehumidifiers were used for drying to prevent future damages. Our team was brought in to handle the cleanup and repair of this daycare facility after it suffered damage from a large water loss. We arrived on site quickly and had them back up and running in a short amount of time. The drying equipment pictured here was brought in to help expedite the drying process in order to mitigate further damage after this daycare facility suffered damage from a water loss. If you have water damage like this, give us a call. The daycare pictured here suffered from a large water loss and we were called in to repair the damage. The dehumidifier in this image was used in conjunction with other drying equipment to take care of the moisture quickly so that further damage could be prevented. When this building suffered a large water loss, multiple rooms were impacted. In this room, you can see that we performed flood cuts to remove damaged material and brought in drying equipment to help speed up the drying process. Joe and Celsie Sneden of Neat Method pose for a quick photo at this morning’s Overland Park Chamber of Commerce. Congrats Celsie, and welcome to the OP Chamber! The equipment in this image was brought in to deal with moisture from a large water loss that impacted this daycare facility. Call us if your business suffers a loss like this. We are faster to any size disaster. In this image, you can see that we are in the process of demolition on this daycare facility after it suffered heavy damage from a large water loss. When we were finished, we left it looking "Like it never even happened." 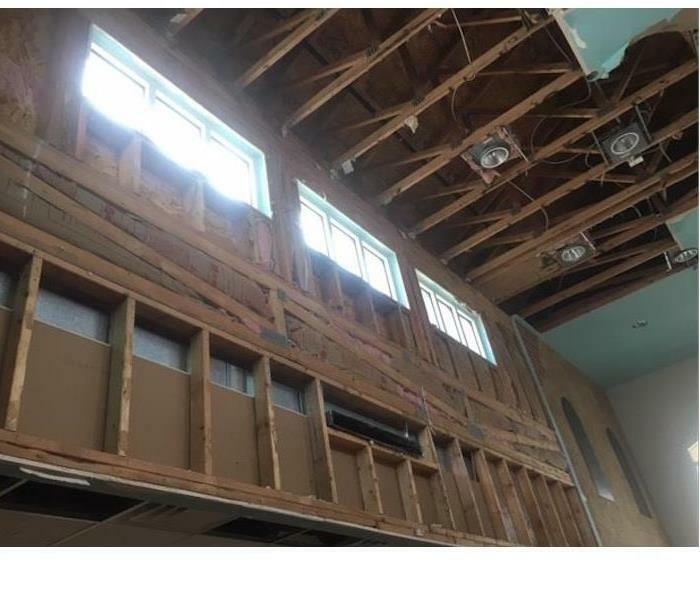 Our team was called to repair this facility after it suffered a heavy water loss that impacted the entire building, including the wall pictured here. If your business suffers a loss like this, give us a call! 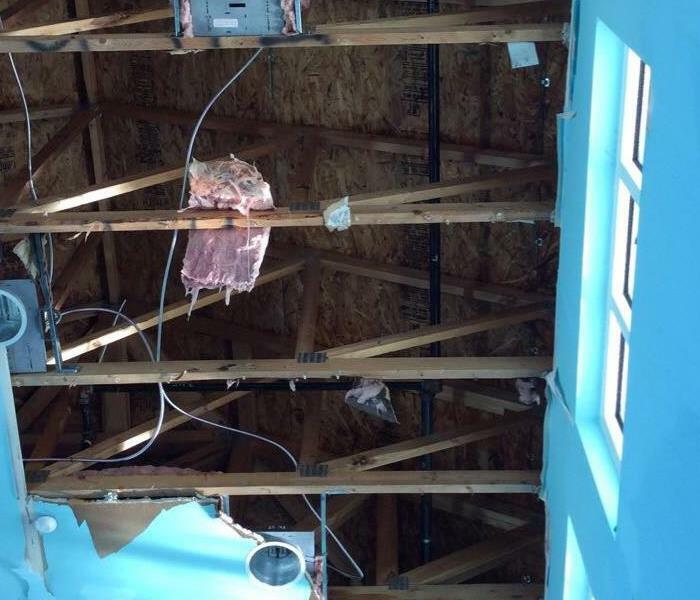 In this image, you can see wet, damaged insulation and drywall in a daycare facility that was heavily damaged by a water loss. When we were finished making repairs, we left it looking "Like it never even happened." 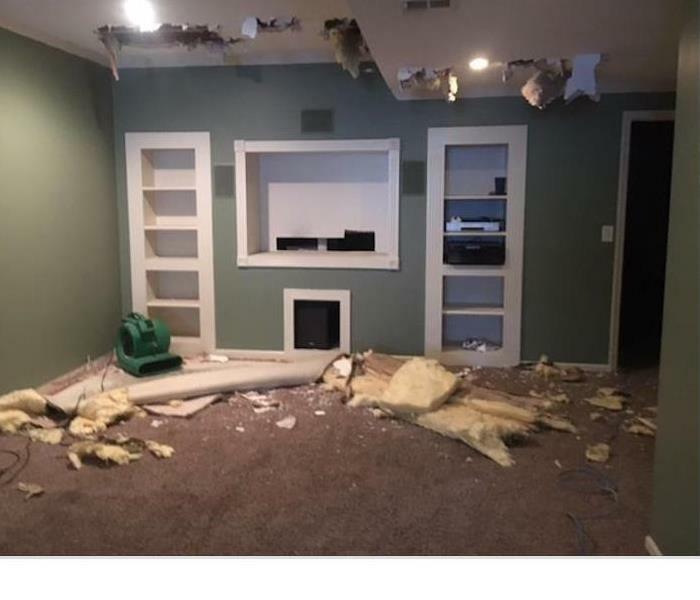 When this home experienced a water loss that left the bathroom in this image flood, the crew of SERVPRO of Leawood/ Overland Park was quick to respond to the call. We arrived quickly and had the repairs made in no time. SERVPRO responded to this home after a severe storm. The team came in and immediately began storm clean up. There was significant water in the floor and drywall damage. They used air movers to dry the floor quickly to prevent future damages. This was the aftermath of a house fire. The home suffered from significant fire damage. There was smoke and soot damage. SERVPRO was able to come in and completely remodel this home from ceiling to floor. This home had a massive fire in the bathroom that caused significant damage. SERVPRO was quick to respond and begin the mitigation and cleaning process. If you have any questions about our services, feel free to reach out to us at anytime. This office suffered from water damage after a leak. The content in the office had significant water damage. SERVPRO was able to salvage some of the important pieces with special drying techniques. We are available 24 hours a day. After a significant water loss, SERVPRO used professional equipment for drying and restoring this property back to normal pre loss conditions. The dehumidifier was brought in the help remove moisture from the air for quick drying. Mold can grow quickly, it is important to contact a professional for quick remediation. The walls suffered from mold and mildew. SERVPRO responded to clean and treat the area professionally. Once it was all clean, you could never tell there was damage before. After a water leak this property suffered from significant amount of water damage inside. The floors were flooded and content suffered from water damage. 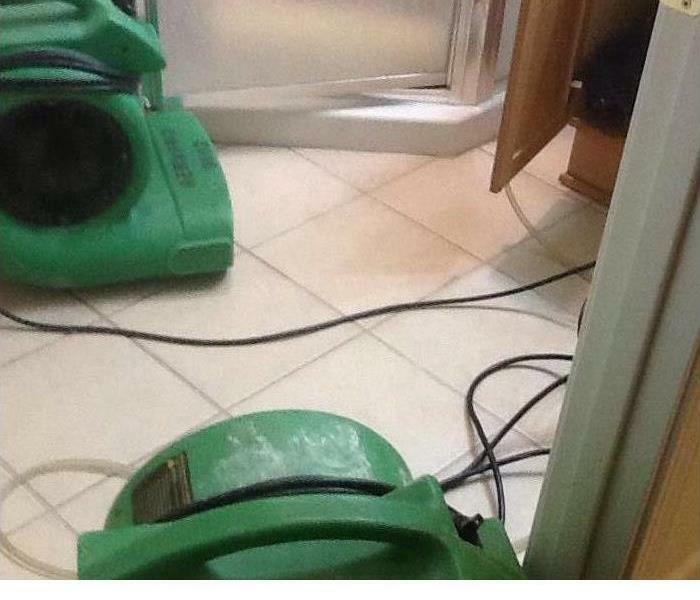 SERVPRO responded with professional drying equipment to dry the property quickly. This business suffered from water loss after a leak. The team at SERVPRO responded and began mitigation. They performed flood cuts to dry behind the walls and prevent any future damages. If you have any questions, feel free to reach out anytime.